The metal-clad façade, inspired by nearby Virginia creepers, is inset with Schueco window systems. 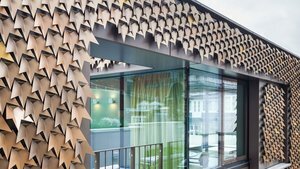 The Virginia creeper growing on a nearby building proved the inspiration for Squire & Partners’ remarkable metal shingle façade of a new private house in the centre of London’s Mayfair. This highly expressive elevation, which comprises more than 4,000 folded aluminium leaves, was combined with a Schueco thermally broken casement window system – Schueco AWS 70 BS.HI – and the Schueco ADS 80 FR 60 E160 door system. Both were chosen for their slim profiles, level of finish and because the aluminium profiles matched the metal of the leaves. These were used with some modifications – there was an agreement with Schueco for larger than standard sizes of the taller windows on to the lightwells on the flank façades. The project involved the retention of an 18th century façade in combination with a new building to create a five-bedroom house with a rooftop pavilion, two roof terraces, a swimming pool, cinema and gymnasium. Judges enjoyed the original and highly-crafted elevational treatment. ‘There’s a sense of solidity. It bridges between the modern and traditional well, and uses apertures in a wall in a fresh way,’ says Deborah Saunt. ‘The detailing is very minimal and appropriate against the layered façade,’ says Paul Monaghan. View through the living space to the roof terrace.